Holy Cross Hospital has applied to shutter its inpatient physical rehabilitation unit, blaming specialty rehabilitation services for the decline of patients on Chicago's Southwest side. Admissions since 2013 have declined 34% as patients migrated to community, home-based and specialty rehabilitation hospital settings, officials wrote in an application to the Illinois Health Facilities and Services Review Board, which must approve the closure. 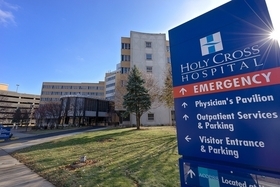 The board received Holy Cross' application August 21; the hospital hopes to discontinue its 34-bed service by November 1. If approved, space currently occupied by the inpatient unit at 2701 W. 68th St. will be used to expand other services, although officials have not yet decided which services to grow, said Paul Berrini, vice president of strategy and marketing at Sinai Health System, which owns Holy Cross. He noted that expanded behavioral and mental health care are particularly needed in West Englewood, Chicago Lawn, Archer Heights and other neighborhoods served by Holy Cross. Holy Cross plans to refer patients to Schwab Rehabilitation Hospital, another Sinai-owned medical facility located seven miles north of Holy Cross. In its application, Holy Cross noted that 15 other hospitals nearby also offer the same physical rehabilitation service, including Advocate Christ Medical Center, Rush University Medical Center and Mercy Hospital and Medical Center. Holy Cross is a 298-bed hospital that was snapped up by Sinai in September 2012. Located in Lawndale, Holy Cross serves large numbers of Medicaid and uninsured patients and is a safety net hospital for the area. Sinai operates four hospitals in the Chicago area. "Sinai-owned Holy Cross plans to close physical rehab unit" originally appeared in Crain's Chicago Business.